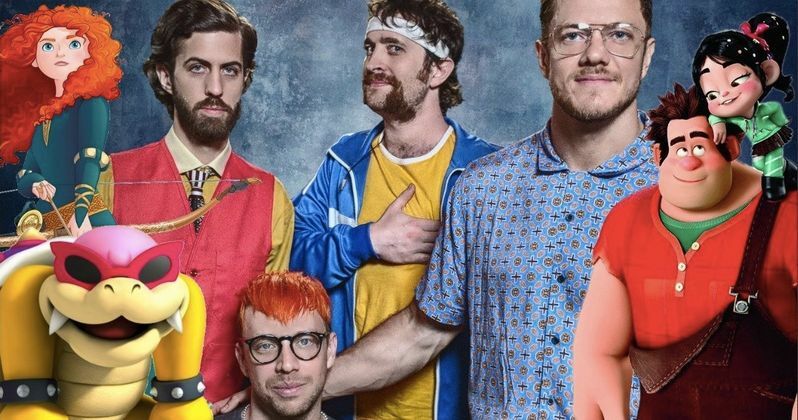 Grammy-winning band Imagine Dragons have debuted the song they've composed for Ralph Breaks the Internet: Wreck-It Ralph 2. The song, titled Zero, will play during the movie's end credits and will be included on the official soundtrack. Today, they've released a lyric video for the song, which gives us a little taste of what's to come in this year's highly-anticipated sequel. Co-director Rich Moore, who helmed the movie alongside Phil Johnston, had this to say about the song. "It's a bold choice for an end-credit song because it's about someone who feels like a zero, someone who hasn't always felt worthy, someone who's allowed his entire sense of self to rely on a single friendship. When that friendship is threatened, there's a lot of insecurity." It's actually a very interesting song. While we don't know where the events of Wreck-It Ralph 2 are going to ultimately take us, it's kind of a bummer, at least lyrically speaking. Musically, it fits right in with the modern pop music landscape. It's kind of all in the title, as it's about someone reflecting on the feelings of inadequacy and insecurity. Though, that does seem to fit Ralph as a character. Songwriter Dan Reynolds had this to say about Zero. "It's a pretty timely movie in a lot of ways in that it addresses some of the issues of identity and loneliness unique to this internet generation. Ralph's internal struggle for self-acceptance really resonated with us, and this song speaks to that...The song is a dichotomy in some ways, with sometimes heavy lyrics over pretty upbeat instrumentation. The result is a tone that is somewhat bittersweet, which felt appropriate given the complexity of Ralph as a character." Imagine Dragons, for their part, have been featured on a ton of movie soundtracks in the past. Some of their previous credits include Transformers: Age of Extinction, Suicide Squad and The Hunger Games: Catching Fire. But this time, they actually got to compose a song for the movie itself. Co-director Phil Johnston also added his thoughts on the song. "We can all relate to that feeling. But the song tells us we're not alone. They nailed the theme of the movie in a way that also makes you want to dance." Whether or not you like this song, this just means we're that much closer to Wreck-It Ralph 2 actually arriving in theaters. The first movie was released in 2012 and went on to become a huge hit, grossing $471 million worldwide. Disney took their time in crafting the sequel, but it looks like, based on everything that we've seen so far, it may have been worth the wait. This movie is going to have Star Wars characters and virtually every Disney Princess ever in what looks like it's going to go down as an all-time epic animated scene. If you do happen to like Zero, the song, which will be featured on the upcoming Walt Disney Records soundtrack, is available today from KIDinaKORNER/Interscope Records. It's also available on Spotify and other music streaming services. You can check out the lyric video from the Imagine Dragons YouTube channel for yourself below. Ralph Breaks the Internet: Wreck-It Ralph 2 is set to hit theaters on November 21.